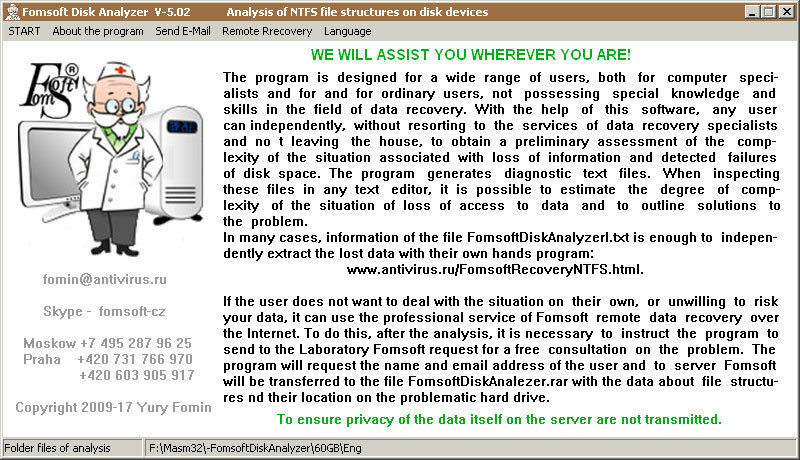 data Recovery with their hands, the Main menu of the program Fomsoft Disk Analyzer V-5.02. Main menu of the program Fomsoft Disk Analyzer V-5.02. After starting the program displays a window presented on the Fig. 5. Fig. 5. The program's main window. 1. Selection and analysis of a disk Main executable item. 2. About jump to the page describing the program. 3. Send E-Mail send the message by email to the Laboratory data recovery Fomsoft. 4. Remote RAID recovery and data Go to page remote data recovery and RAID arrays. 5. Language select the interface language. Bottom line consists of two fields. The left field displays the analyzed source disk, if it is selected. The right field contains the path to the directory where will be stored analytical files. After starting the program this directory is the folder where the program starts.